This page tells you all about Stripe: how to sign up for a Stripe account, how to configure the Stripe payment processor, and at the bottom of the page, we supply some additional links to the Stripe help pages. With Stripe, you don’t need a merchant account or gateway. Stripe handles everything, including storing cards, subscriptions, and direct payouts to your bank account. To get started with stripe, jump over to their site http://stripe.com, and select "Create Account"
Starting an account with Stripe is free. You will need to provide your email address and create a password to login. Also, you will need to follow directions in an email that Stripe sends to validate your account before you can start charging credit cards for real. Next, you will want to activate your account. Prior to activating your account, you can only interact with Stripe in test mode. With the exception of the ability to make a real charge to a credit card, all of Stripe's features are available in test mode. Activating your account is a simple process: you fill out a form requesting some basic information about your product, your business, and your own personal relationship to your business. Once you've activated your account, you can immediately start using the live API and charge real cards. 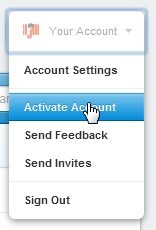 Fill out the form and click on the "Activate Account" button. Next, you will want to configure the payment module on your site. Navigate to "Shopping Cart" and then, "List Payment Methods". This will display a page with all of the payment modules available. Select the "Credit Card" payment module that uses the code "STRIPE". This will open up the payment module's configuration form. On the "General" tab, check the box "Active?" to enable the payment module. Also select which cards you want to accept. Be sure to check out what card types Stripe accepts (Visa, MasterCard, American Express, JCB, Discover and Diners Club). This may change so be sure to check in with Stripe from time to time. Now click on the "Configuration" tab. On this tab you have quite a few options. Lets go through them. Setting it to "Production" will set the payment module to start running credit cards through the processing network. 2b. Charge Type: For some selling online, they prefer to check the credit card to see if funds are available, and then hold those funds to be captured later once they have confirmed the order and shipped it. Having "Capture Separately" checked sets Stripe to do just this. Unchecked, Stripe will capture the funds from the shopper's credit card account at the time that the order is placed. 2c. Error Messages: By default, failure messages from Stripe are displayed to the shopper. With this box checked, more detailed error messages are displayed. It is good to check this box if you are experiencing issues with Stripe. 2d. API Keys: There are 4 API keys that Stripe provides. These fields are where you need to place them. It is required that you place them here before the Stripe payment module will start working. There are test keys and production (live) keys. To retreive your API Keys from Stripe, go to your Stripe Dashboard and select API from the left menu. This window will show you your Live or "Production" keys, which you should copy and paste into the corresponding "Production Key" cells in the Configuration window. Next, click on the View Test Data slider in the left menu. With the Test Data slider activated (should turn orange), the API keys will change to your Test Keys, which should be copied and pasted into the corresponding "Test Key" cells in the Configuration tab. Now your API keys are in place. Make sure to switch your "View Test Data" slider off before taking any non-test transactions. See the help documentation on Stripe's website for further assistance. 2e. Order Status: You have 3 different status' you can assign to the Stripe payment module. The changing of these status' also communicate to Stripe and make changes to the transaction (requires webhook). The "Card Charged" status is what the order is set to if the credit card was charged and the funds were captured (not just authorized). If this is the order status on your website, on the Stripe panel status will be "Paid". The "Charge Failed" status is used for canceled orders or refunds on the Stripe site. If this is the status for the order, then the Stripe panel status will be "Refunded". The "Charged Authorized" status displays if a credit card has been authorized for the funds but the funds have not been captured. This correlates to the Stripe panel status of "Uncaptured". Now, on your Stripe API page, select the "Webhooks" tab. On this page click on the "Add endpoint" button and paste your webhook URL as copied from the Stripe payment module on your website. You will want to create one for test events and one for live events (same webhook URL). BE SURE YOU SAVE YOUR CHANGES TO YOUR STRIPE MODULE BEFORE CLOSING THE PAGE.